The Top of the Hill Celtic team who can join Park Bar on top of the Premier Division table should they claim victory on Sunday. and Phoenix have the opportunity to join them at the top of the league table. Phoenix take on Brandywell Harps at St Columb’s Park in the match of the day while Top of the Hill Celtic meet an improving Culmore team. Trojans meet Oxford, who have yet to register a point, at the Showgrounds. Lisahally host Don Bosco’s while Tristar take on Campbell’s. All games kick-off 11.30 a.m.
Fixtures - Lisahally v Don Bosco’s (Strathfoyle); Top of the Hill Celtic v Culmore (Lisnagelvin No.2); Phoenix v Brandywell Harps (St Columb’s No.2); Trojans v Oxford (Showgrounds); Tristar v Campbell’s (Prehen No 1). Lisahally registered their first points of the season last weekend after comfortably defeating bottom side, Prehen.Spike Doherty will be hoping to add to that this week when they play Don Bosco’s who appear to be having problems fielding 11 players. To date Bosco’s have yet to put a point on the table and they still have to play the top teams. They have a good record against Lisahally on their home pitch so a tight game looks in prospect with a draw the likely outcome. Colin Logue’s team have six points from their first two games and will be fancied to win on Sunday to take them level on points with league leaders, Park Bar. They have most of last season’s title winning team among their ranks and with new signing Gavin McShane having scored a hat-trick last Sunday, the signs are looking good. The Waterside men have a habit of slipping up against sides they should defeat comfortably, however. Culmore boss Donal Dorrian was delighted with his team’s display last week against Campbell’s before losing to a late goal. He will be looking for the same effort from his team in this contest. Top of the Hill Celtic to win. Under the guidance of Christy McGeehan, Phoenix have come on leaps and bounds in the last couple of seasons and his hard work is now paying off. This will be their toughest game so far this season having recorded wins over Oxford and Don Bosco’s. Last week they had to bring goalkeeper, Eamonn Canning out of retirement and, as usual, he played well. Liam Deery has a nice blend of youth and experience in his squad and, like their opponents, have won both their opening games. Last season’s runners-up will face teams in the top six and that will test them to the full and show just how far they have progressed and of course, determine if they are worthy title challengers. Harps to win a close game. 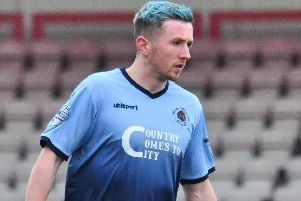 Tristar have had a tough start to the season but Chris McGarrigle’s side have shown a lot of spirit in defeats by Brandywell Harps and Park Bar - two teams likely to figure in the title race. They have three points on the table so far and keeper McClaren has been on superb form while Decky Divin has been amongst the goals. Campbell’s will go into this game as favourites but Kevin McGinley knows they had to battle hard for last week’s victory with Harkin, McNaught and Dee Starrett performing well for the Waterside men. After their opening game against champions, Top of the Hill Celtic when they narrowly lost out, people have sat up and have taken notice of them. Last week Trojans manager McDermott was left puzzled as to why they took nothing from their game against a highly fancied Park Bar team. With a full strength side available on Sunday, Oxford could well suffer a backlash. They have added experienced keeper, Darren Smyth to their squad. They defeated Oxford in both league games last season and current form predicts that trend to continue on Sunday. Oxford manager, Paul Roddy appears to have problems getting a full team out which is surprising. Last Sunday they took a heavy beating so they will not exactly be looking forward to this match. There will be a meeting at 7.30 pm. next Monday at the A.O.H Showrooms when the draw will take place for the first round of the Derry City sponsored, Terry Kelly Memorial Cup. Teams who were fined in the last few weeks must pay all outstanding monies at this meeting. Failure to do so will result in further action taken against them. All teams connected with the D&D extend their condolences to the family and friends of Gerry Brown who sadly passed away at the weekend.